can I tell google maps to avoid motorways? 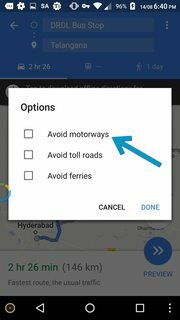 Is there any way for me to tell google maps, to avoid motorways? I'll add some screenshots to show why the currently suggested answer doesn't seem to apply. 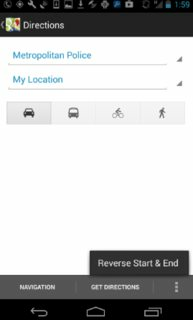 So I see the icons for car, bus, cycling, walking. Say I tap the bottom right three dots. Then it just says "Reverse start & end"
If I tap the car, then I get two options. Get Directions, or Navigate. There's no 3 dots in the top right or anywhere, with a "route options" option, that the suggested answer mentions. I'm not seeing the option to avoid motorways. The following seems to be the answer though I haven't put it in practise yet. 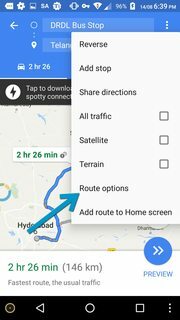 in google maps, choose navigation, then in the bottom right there are 3 horizontal bars, then it has options of "routes and alternatives, directions list, layers, turn off voice, exit navigation, more". Choose "routes and alternatives"
Then it has 4 buttons..
A button with arrows pointing to what looks like a raindrop. A button with 3 dots with 3 horizontal bars alongside the dots. Click the button with 2 cogs. Then it says Route options. Avoid motorways. Avoid toll roads. You can choose "Avoid Motorways". I'll include some pics when I can. Open the Google Maps app Google Maps. Search for your destination or tap it on the map. In the bottom right, tap the blue circle. It'll show a car, bus, bike, taxi, or person walking. At the top, tap Drive . In the top right, tap More three vertical dots and then Route options. Tap Avoid tolls or Avoid highways. Okay, this is how I did it. Tap blue bar at bottom which says "directions"
Look down and locate and top "Route Options"
How can I share directions/route from Google Maps App? 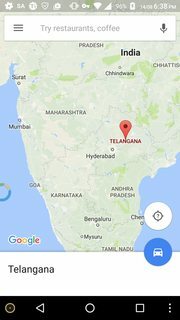 Where can I download Google Maps 5.0? 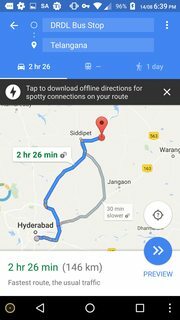 Why does Google Maps Display Routes/Waypoints Differently on Phone than on PC? 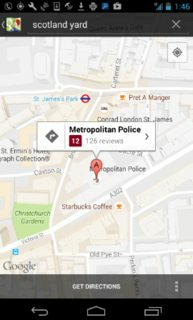 How can i make my google maps app close?